Almo Professional A/V kicked off its ninth Almo ProAV E4 AV Tour this week in a suburb of Washington, DC. The one-day event consisted of 12 sessions, 10 featured speakers, 35 exhibitors, and two hands-on workshops. Attendee Dan Pierce of Building Infrastructure Group emphasized the importance of these local shows, saying that he and his fellow Chantilly, VA-based companies would likely not have been able to go to another event. This was his first time attending. “We got to learn a lot of stuff, see a lot of things,” Pierce said. He specifically called out Chief’s Fusion Dynamic Height Adjustable Mobile Cart as a cool product, as well as the seamless digital signage offerings. The sessions at the E4 AV Tour offer attendees the opportunity to earn CTS recertification units approved by education partner AVIXA; a scanned badge is the proof of attendance. In a morning session titled “OLED: the Curve of the Future,” LG senior engineer John Fisher made clear that the title is more literal than figurative. OLED technology enables panels to have flexibility, which means curved and bendable displays are now possible. Additionally, OLED panels enable deeper blacks and truer whites than LCD, among other advantages, Fisher said. Taylor and Craigmyle also touched on industry trends for 2018. 4K is already here in terms of content and the price point, so it is beginning to be widely adopted, Craigmyle said. Taylor emphasized that the industry should expect more growth in digital signage and huddle rooms, and Craigmyle called attention to indoor direct-view LEDs. Craigmyle noted that the show’s education programs are not the main draw for all attendees. According to attendee surveys, she said, “The number-one reason is to see new technology, very closely followed by education. It’s really that emphasis that we have put on bringing the latest; we have products here that have never been shown in the U.S. Capping off the event, football legend and local Virginian Joe Theismann delivered an end note address that drew parallels because success in athletics and success in the business world. 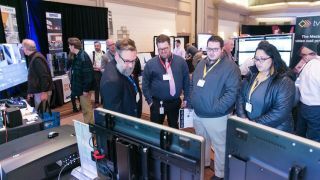 The 2018 Almo ProAV E4 AV tour will continue with stops in Dallas and Boston, with the tour’s final event in Nashville.